Alphasonik PSW112C - the Alpha 100 series subwoofer. You can achieve natural sound in sealed, ported and bandpass enclosures with Alphasonik's 100 Series Stamped Subwoofers. Featuring polypropylene cone and 8-gauge lug-loc terminals, this family of woofers stands above other contenders. 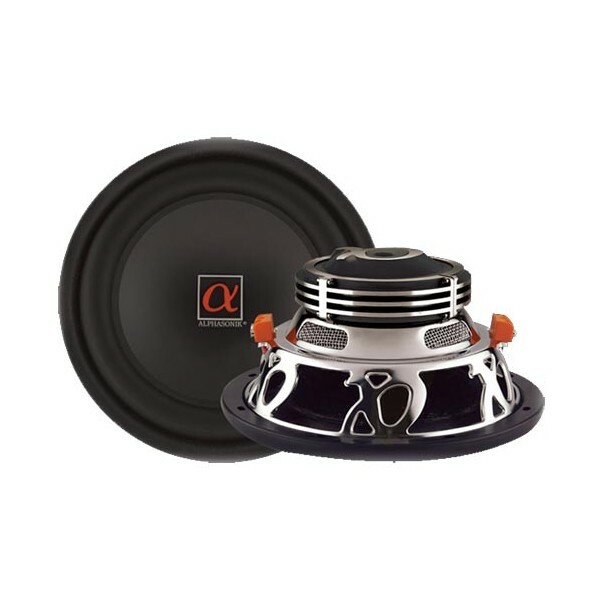 The Alphasonik PSW112C is enhanced with a stylish voice coil venting system and a chrome stamped steel basket. In addition, PSW112C use laminated non-pressed paper cone and patented 8-gauge Lug-Lock input terminals. The phenomenal performance did not change and it remains ideal for sealed, z ported and bandpass enclosures. great subwoofer i had ever !!!!!!!!!!! Great subs, had 2 fitted in my clio brilliant bass fantastic price carnt fault them . hi i have a fli active 12 inch sub. would this subwoofer work in the box i have or would it need to be amped from a more powerful unit? I have a pmz3002a bipolar and i am in need of a remote for the bass can you help !!! Hi there we do not stock this brand. Hi, is this sub dual coil or sngle? Its a dual 4 ohm voice coil.